As you may have figured out by now, I have a pile of Marvel Team-Up issues that I have never read. Sure they are over thirty years old…but they are new to me. When I saw an issue with Ant-Man on the cover I was interested. And then I discovered that it was Scott Lang which reminded me you cannot stop the Ant-Man from theater glory! It became an instant must read! So let me get out of the way and breakdown Marvel Team-Up #103! In “The Assassin Academy”, Scott Lang,ex-con and recently named Ant-Man, has settled down in the suburbs with his daughter Cassie. His domestic bliss is broken when a former prison friend visits and offers him a job with a secret criminal organization. Soon after, Lang’s old friend is killed leading him to track down the secret criminals. Meanwhile Daily Bugle photographer Peter Parker is ordered to track down all the missing criminals. His search leads to a confrontation between Taskmaster and Spider-Man at the villain’s newly established school for evildoers. Will Lang’s search lead him to the same location? Can the two buggy heroes come together to save the day? This March 1981 covered dated issue was on sale December 23, 1980. So some of you might have been lucky enough to get it in your Christmas stocking! The story was written by David Michelinie, with pencils by Jerry Bingham and inks provided by Mike Esposito. 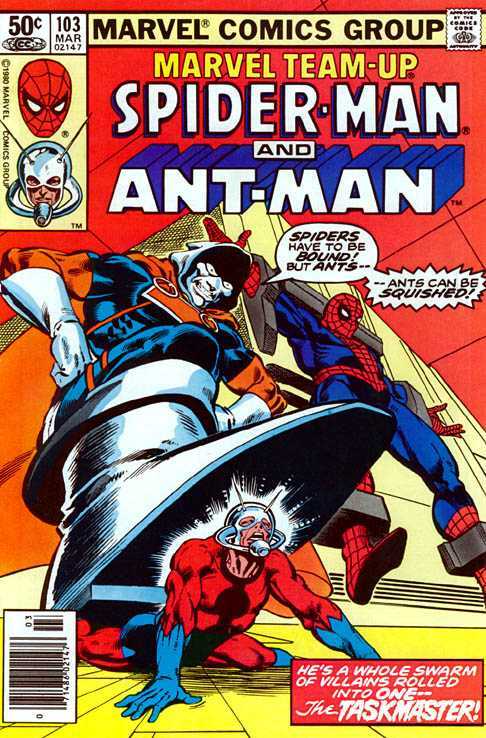 The story starts out as Scott Lang is working on a top secret project as Ant-Man. And Agent Ben would love this. Lang is not sabotaging Doctor Doom’s next attempt to take over the world. No, he is not fixing Iron Man’s gauntlet from the inside. He is fixing Cassie’s Rom doll! You have to love early synergy. Wait, I thought Rom was a real hero in the Marvel 616m not a toy? There is a lot of new in this issue. Lang is the new Ant-Man and he is a developing hero. I honestly did not realize he was Ant-Man all the way back to 1980 so I was a little shocked by this revelation. As a character he is still uncertain and is taking steps to being a greater hero. And the fact that he is the new Ant-Man is really a big key to the story. Taskmaster is also new. This is the third Marvel issue that the villain, who really needs to be in the MCU, appears in. This early Tasky is all business and is years away from being a buddy with Deadpool with plenty of corniness. The story itself is one and done with a fast pace. The story really combines an experienced hero with a new hero. So of course some mentoring can occur while still allowing the new hero to show his skills. Seriously, Agent Ben would love this. There is an advertisement for Dazzler #1 complete with Dazzler in roller skates. And there is a Hostess Cupcake ad, which really does not make a lot of sense. This issue just hits Agent Ben in all the likes. Clearly this story was written for Agent Ben. Still, I really enjoyed Marvel Team-Up #103 also and it could be one of my favorite Scott Lang stories, which is not saying a lot. So I find myself really pleased this issue climbed to the top of my pile!